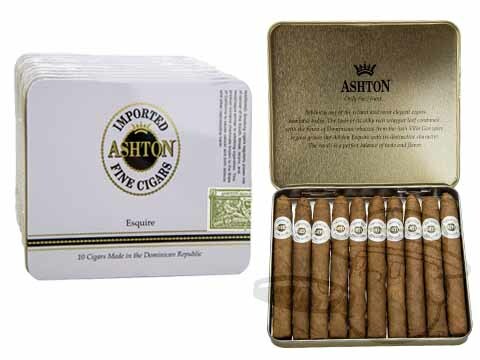 Famous for smooth taste and unerring consistency, Ashton Classic Esquire Natural cigars are crafted using a seamless blend of 3-4 year old Dominican fillers blanketed in a light Connecticut shade wrapper. The mellow-bodied, fan-favorite Ashton Classic line is available in a wide range of sizes, making it not only supremely delicious, but easily accessible as well. Ashton Classic Esquire Natural is a pleasantly mellow smoke, offering tasting notes of cedar, cream, subtle vanilla, and almond in a convenient 4 1/4 x 32 cigarillo. Absolutely wonderfully smooth. Love it. These are the perfect cigar if you don't have the time to smoke a larger cigar. Smooth and perfect in a small package. A really 1st class smoke - one of my favorites! Like the natural, better then the maduro. Very mild - easy to smoke. Pleasant tobacco taste. Just cost too much. I have smoked a large variety of smaller cigars as a reins day stick or a quick smoke. This is the best I've had. It smokes like a larger cigar. Just wish BCP would offer a quantity between 10 and 100. Ashton Classic Esquire Natural is rated 4.7 out of 5 based on 9 customer ratings.